Our cities can be made less flood prone, provided we conserve and protect their fragile environmental resources and resist the tendency to convert them into real estate. For most of Mumbai’s inhabitants, monsoons are a new round of struggle with the city – anticipating its moods, enduring its wrath, negotiating its whims. Only someone far removed from the city’s lived reality can be unmoved by this state of affairs. Almost every time it rains, residents of Nala Sopara to the north step out of their homes into knee-deep water and wade to work. In Mankhurd, another eastern suburb, single storey transit accommodations begin to sink and families throw out pails of water to keep their homes afloat. 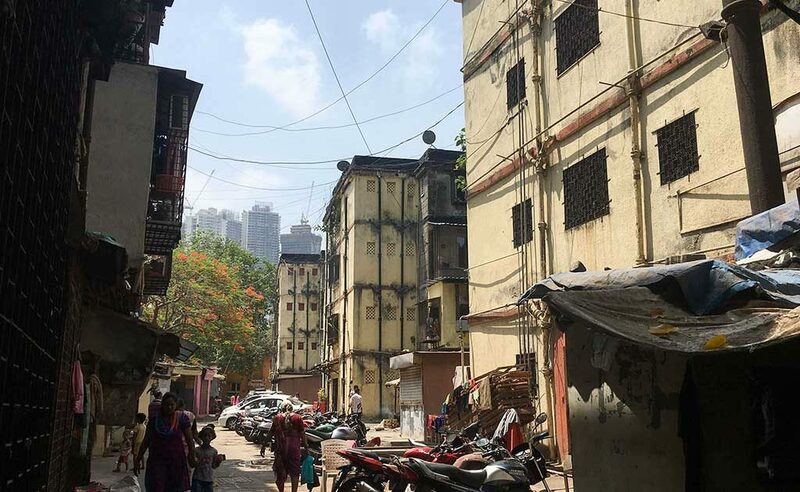 In Mahim in central Mumbai, families carefully stack up their belongings – most valuable on top – as they watch water seeping through their walls. Each time it pours in Mumbai and the city floods, we hear tragic stories of its many victims and inspiring stories of courage, support and mutual aid. Yet, to talk about floods year after year as a story of disaster and resilience, helps bring some consolation, but not relief. Any city that regularly demands such a price for survival and such a toll on human life, is not unprepared for calamity – it is unprepared for normality. And the normal in Mumbai is shifting – it may be a mistake to blame every single incident of extreme rainfall on climate change, but the general trends are unmistakable. Over more than a century, average temperature in Mumbai has risen by 2.4 degrees. 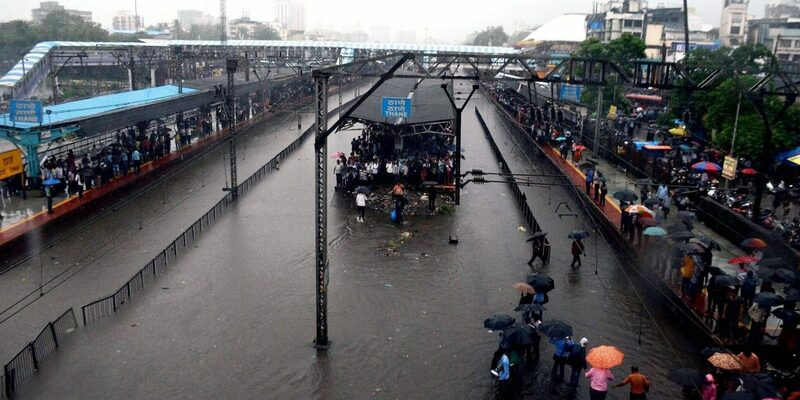 According to the Indian Meteorological Department (IMD), there have been nine extremely heavy rainfall days (more than 204.5 mm) in Mumbai in twice as many years. Even the annual frequency of heavy rainfall events (64.5 – 115.5 mm) has seen a steady increase in recent decades. There seems to be an enormous gulf between the actions demanded by the city’s perpetual crises and what its institutions and systems can possibly deliver. But the city continues to be shaped in ways that will exacerbate climate change on the one hand and inhibit ways to cope with increasingly unpredictable climate impacts on the other. Unfortunately, the press coverage on and analysis of flooding in Mumbai customarily decry “lack of planning”, “corruption” and “non-implementation” of infrastructure projects as the main causes of the city’s recurring flooding problems. Undoubtedly, we need to act with urgency. But more urgently, we need to re-define our problems. We need to establish that flooding is an environmental, not an infrastructural crisis; to re-conceptualise the relationship between land and water; to reframe how we understand ‘infrastructure’ that can sustain overlapping urban ecosystems; and to reconsider our approach to city-making. The science of flooding requires understanding the relationship between land and water. Rainwater can either be absorbed and contained by land (call it land’s ‘absorptive capacity’) or allowed to drain into natural water bodies (call it land’s ‘drainage capacity’). The capacity of land to do either one or both of these can be enhanced or constrained by a transformation of its use and physical features. Flood plains, coastal wetlands, salt marshes, lakes, rivers, natural green cover, fields, unpaved open-spaces – all of these are lands that provide the vital service of absorbing surface water and recharging ground water. On the other hand, areas of the city that are paved-over need to be designed to drain away water that ‘runs-off’ its surface – by slope management and by a carefully integrated system of artificial and natural channels. Land, therefore is a central component of the overall infrastructure for flood management and changing its nature significantly affects how water behaves as it falls from the sky. In other words, land provides not just living space, but also sustains vital ecosystems; it has economic value, but also provides ecological services. A systematic failure to recognise the relationship between land and water is behind much of our flooding problems. Much of what goes in the name of ‘development’ involves eliminating land’s absorptive capacity by filling up of ponds and lakes, conversion of permeable green cover into impermeable concrete and ‘reclaiming’ wetlands and salt marshes. Crucially, land development practices have also constricted and sometimes erased natural drainage systems – and therefore rather than managing the run-off water that ‘developed’ areas produce, the city has made itself more and more vulnerable to flooding. Flooding then, is a symptom of our increasingly worsening urban-environmental crisis. 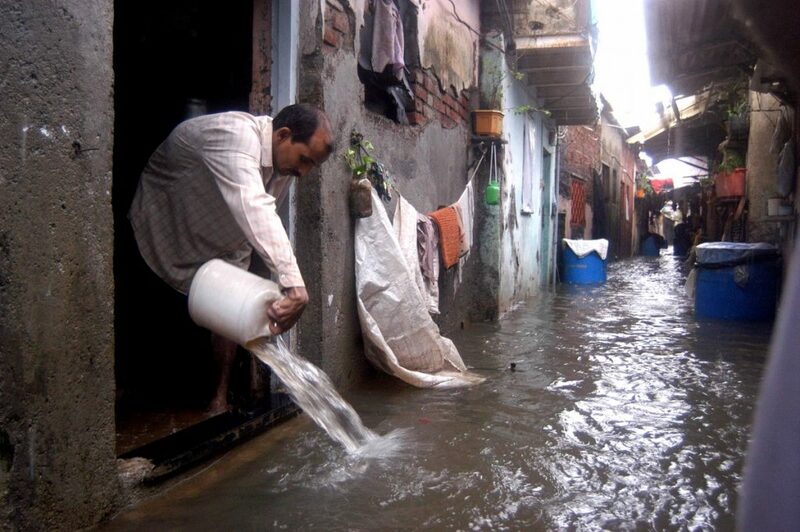 However, instead of strengthening our existing environmental and urban systems – that constitute our existing socio-ecological infrastructure – we invest faith and money in mega-projects like the Brihanmumbai Storm Water Drainage project (BRIMSTOWAD), that are often ineffective and almost always unaccountable. The BRIMSTOWAD involves creating a network of storm-water drains, concrete embankments along nallahs and pumping stations near the mouth of estuaries. This has resulted in the narrowing of the width of streams and estuaries, shifting of high-tide lines and consequent loss of the mangrove ecosystems (which act as a natural buffer during high-tides) upstream of the pumping stations. While the project’s pumping facilities do eject large quantities of water into the sea, in some cases, they have been seen to shift flooding to other areas – the case of Juhu Moragaon fishing village is a notable example. Therefore, rather than simply blaming a supposed lack of planning and demanding project implementation, we ought to reconsider our existing planning and infrastructure practices. Mumbai’s 20 Year Development Plan proposes to open up 3,300 hectares of land that is almost entirely green cover. The coastal freeway project envisages large-scale reclamation and is – according to its own project report – likely to cause serious environmental impacts. The Metro project proposes to take over multiple wetland patches, forested areas and open spaces for its various car-sheds. In many cases, it is precisely these plans and projects and not their absence, that we ought to be worried about. And to implement some of these projects and plans, environmental regulations like the Coastal Regulation Zone (CRZ) that provide some protection to the city’s coastal ecology and unbuilt landscape are being gradually eroded. With every redevelopment project of older finer-grained neighbourhoods such as the BDD Chawls or MHADA layouts, where large footprint buildings will take up most of each plot of land and its natural cover, we reduce land’s absorptive potential. With every riverfront or beachfront beautification project that replaces the soft edge ecology with impervious ‘landscaped’ gardens, we constrain land’s ability to soak and drain. Our existing planning practices are based on the mindset that the exchange value of land must determine its use, and every other value must be subordinated to this singular aim. Consequently, land is reclaimed, its edges hardened, its boundaries guarded. To service this aim, projects like the BRIMSTOWAD are devised, slave to a mindset that assumes that all rainwater is unwanted, will run-off and must therefore be drained out of the city through a built network of pumps, pipes and passages. Our cities are being built on the logic of land economics and hydraulics, instead life systems and hydrology. And therefore let us ask: is it possible to develop a paradigm that conceives the city as a previous landscape, with a delicate relationship between its land and water, sustaining the various life processes that depend upon it? An ecological paradigm would consist of at least four approaches. The first approach is ecosystems integration. This would involve a careful documentation and re-zoning of undeveloped areas and their natural ecosystems and their conceptual and physical integration as city infrastructure for flood prevention. Lands in Mumbai that were kept aside as No Development Zones (NDZs) consist of plantation areas, groves, fields, wetlands, salt marshes, ponds and streams that provide this vital service. We must look at the ecological planning of these areas and an enhancement of their capacity to function as flood prevention systems. The second is ecological restoration, that seeks to allow ecosystems that have degraded over time to regenerate. Often it involves letting an area simply be, but sometimes artificial remediation may be needed. Many of Mumbai’s streams and rivers have lost their riparian vegetation due to edge concretisation and reclamation. Similarly, wetlands, ponds and lakes have been neglected. Wherever possible, these could be revived. The third approach is settlement upgradation. Some of our communities most vulnerable to flooding live in self-built settlements, that continue to remain insecure and under-serviced. Neighbourhood level infrastructure and service upgradation in the form of waste management, sewage and stormwater drainage and water harvesting will help improve living conditions as well as reduce risks of flooding. Finally, we need development controls and retrofitting of the existing formal builtscape to enable permeation. Water collection and harvesting, de-concretisation of existing water channels, replacing hard-paved areas with permeable surfaces – all of this will improve the capacity of urbanised land to absorb surface water. If carried out plot by plot and building by building, it will do much more to reduce urban flooding as compared to any drainage mega-project. And along with all of these, we may also need to build drains, clean rivers and institute strategies for disaster management and mitigation. A secure urban future calls not just for big urban interventions, but concerted action across a range of scales and practices. Our cities can be made less flood-prone, provided we conserve and protect their fragile environmental resources, and resist the tendency to convert these into real estate. Our cities can be made more resilient, provided we understand and enrich them as socio-ecological systems and resist the tendency to think of them as a series of techno-managerial problems. Hussain Indorewala and Shweta Wagh teach at Kamla Raheja Vidyanidhi Institute of Architecture and Environmental Studies, Mumbai and are members of the Collective for Spatial Alternatives.